In the Wa Wa Wally Waddle’s first year (2010), you had to beat a Camp Wa Wa Segowea alumni relay team to receive a pie. In the second year, we settled on our permanent formula: pies to all female and male age group winners, with extra pies raffled off. Pies have been the Waddle’s “special” from the start, the feature that makes the race memorable and unique. Sure, we have a great race date, a fast course in a serene setting, and other “extras” that make it an exciting morning, but we are known for being the pie race. For seven years, our wonderful volunteers have baked chocolate silk pies, apple pies, cherry pies, coconut cream pies, whoopee pies, berry pies, s’mores pies, and an assortment of other confections. We recently added gluten- and dairy-free pies to the mix. Here’s my question for you all to answer below: What pies would you like to see at the 2016 Waddle? We’ll draw from the list and make some new ones to motivate our runners and walkers. One of our goals this year is to announce our winners about an hour after the 5K starts. This means we’ll stay on target to get you home in time to have pie for brunch. Thank you to everyone who has already registered for the kids mile or 5K. And for those of you who haven’t yet attended a Waddle: Give us a try. You might win a pie! Start of the kids 1 mile race. I still remember doing my first road race. It was the Cary Arboretum 2 miler. That was 30 years and 20,000+ miles ago. I’m committed to training properly now, but I didn’t train for that first race. On second thought, it is more accurate to say I didn’t know I was training for the race. I had, like most kids, spent years running everywhere I went. I ran to my friends’ houses. I ran to get the mail. I ran playing tag, football, and kill the carrier. We had impromptu races on the play ground to see who was the fastest kid in the class. Sign at my neighborhood elementary school playground. As a runner, and a former kid, you can imagine my horror when I saw the above sign at my neighborhood elementary school playground. I couldn’t believe what I was reading. I decided this must just be some sign that the playground manufacturers had to put up. Unfortunately that is not the case. My neighbor who has two kids at the school informed me that her kids complain daily about not being allowed to run during recess (although some teachers will occasionally turn a blind eye). No running during recess, because it is too dangerous! While it saddens me that kids are growing up being told they aren’t allowed to run, I am all the more thankful I get to give kids a chance to become lifelong runners. 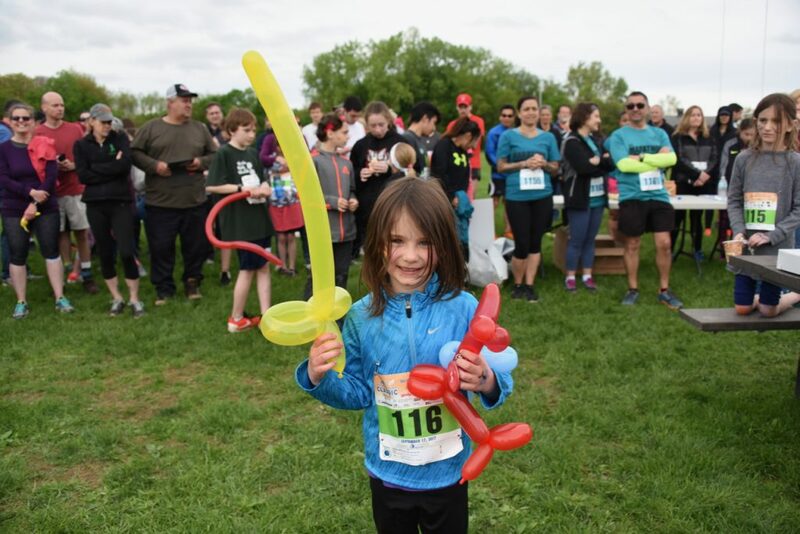 For several years now the Mid-Hudson Road Runners club, with generous support from MVP Health Care, has offered free preregistration for kids races at many of their events. 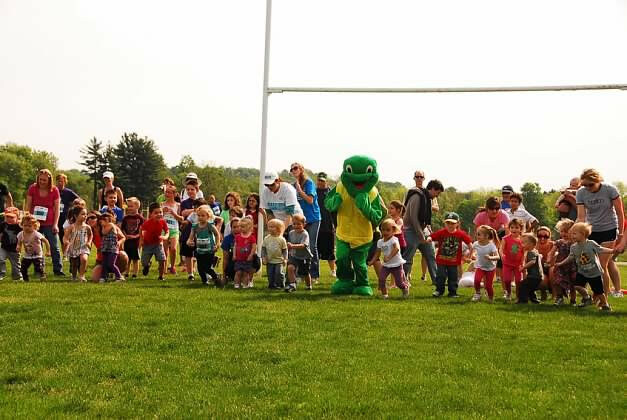 For the past five years, the Wally Waddle has had both a 100 yard Wally Dash (for kids 6 and younger) and a 1 mile race (for kids 13 and younger). The 100 yard dash requires no registration and is held just before the start of the 5k on the rugby field at Vassar Farms. 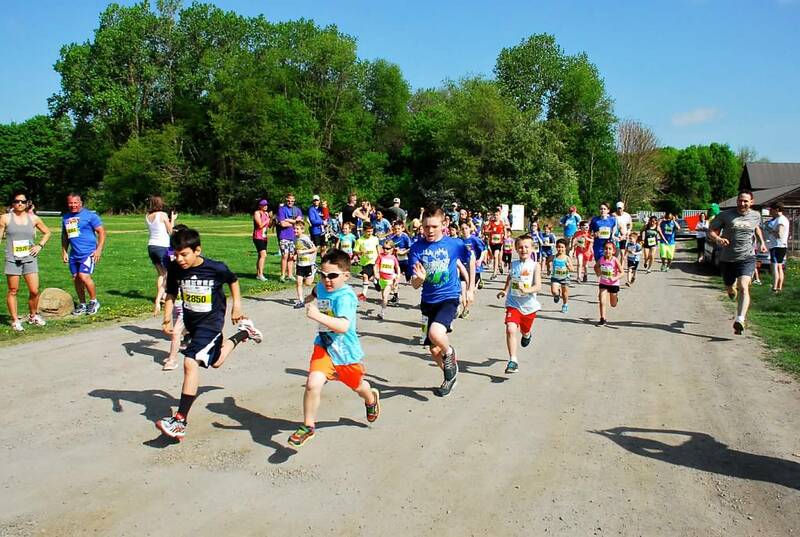 The 1 mile race is free if you preregister your child at www.mhrrc.org and only $5 on race day ($10 gets you registered and a great kids t-shirt). Finishing the 1 mile race. So join us this Mother’s Day and set your child on the path to lifelong fitness! 10:30 (or thereabouts) the awarding of the pies to 5K age group winners! Once again we will be doing Wally Waddle 5k Mother’s Day Family Teams! 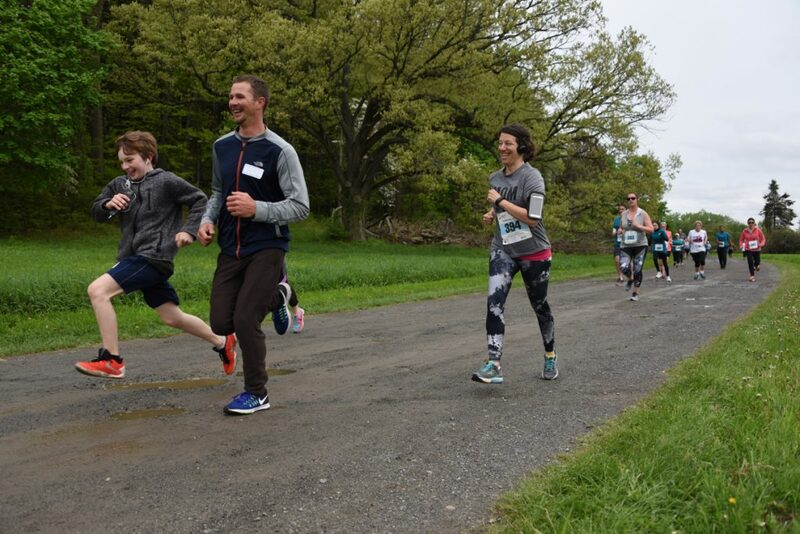 What better way to celebrate Mother’s Day than running as a family? There will be 2 categories for the family teams: Mother/Daughter and Mother/Son. Only one team per family (sorry Mom’s with multiple running kids you are going to have to pick your favorite.) Prizes will be award to the team in each category with the fastest combined time for the 5k. Caffe Aurora is once again sponsoring the Mother’s team with gift certificates to each of the winning teams. Use the form below to sign up your team. You still need to register for the race individually either online at the MHRRC website or on race day. The Wally Waddle 5k always has a great variety of pies: cherry, apple, pumpkin, strawberry rhubarb, moon, s’mores, chocolate velvet, and blueberry have all been part of our offerings. The Waddle pie-makers are pleased to announce that our 2015 age-group prizes will once again include a gluten-free apple crumble and a gluten- and dairy-free s’mores pie. We wanted to take this step to make our prizes more inclusive. Over 2 million Americans eat gluten-free diets because of celiac disease or gluten sensitivity, including the person who maintains the gluten free runner blog. We modified her recipe for the s’mores pie to also make it dairy free. Each home-made pie will be properly marked but if you get a gluten and/or dairy free pie and you have no dietary restrictions, no worries: we promise they taste just as good as the “regular” pies! In addition to award pies, there will be a free pie raffle based on your bib number. We normally have 7-10 pies to give away during the raffle so make sure you stick around for your chance to win! The Wally Waddle 5k always has a great variety of pies: cherry, apple, pumpkin, strawberry rhubarb, moon, s’mores, chocolate velvet, and blueberry have all been part of our offerings. The Waddle pie-makers are pleased to announce that our 2014 age-group prizes will include a gluten-free apple crumble and a gluten- and dairy-free s’mores pie. We wanted to take this step to make our prizes more inclusive. Over 2 million Americans eat gluten-free diets because of celiac disease or gluten sensitivity, including the person who maintains the gluten free runner blog. We modified her recipe for the s’mores pie to also make it dairy free. Each home-made pie will be properly marked but if you get a gluten and/or dairy free pie and you have no dietary restrictions, no worries: we promise they taste just as good as the “regular” pies! Over 600 people participated in the Mid-Hudson Road Runners Turkey Trot races in 2013, making it one of the biggest running events of the year. Why is it that Turkey Trots are such a popular tradition? The Waddle organizers hope to capture three of those reasons with our race: pies, family, and holiday tradition. Pies. Turkey is fairly bland, but pie is full of flavor. We took the best part of Thanksgiving dinner and made it part of our race, handing out pie-prizes to the age group winners and free raffle pies after the awards are given. Family. The 2014 Waddle includes a new Mother/Son and Mother/Daughter competition, along with enhanced free family fun. Mothers with adult children can do the 5K together and mothers with little children can watch their kids race, play games, and get their faces painted. And if Mom’s dream day is to sleep in and enjoy a quiet house by herself, Dad can take the kids to the Waddle and bring them back happy and tired. The Wally Waddle is expanding in its fifth year to add more free family fun. Come for the free kids races and stay for a whole morning full of camp games, face painting, and balloon animals. As parents of two little ones, Josh and Lisa know how important it is to get the kids out of the house for fresh air and fun–especially after this tough winter! We want the Waddle to be an event your kids remember and look forward to, just like our oldest daughter who points at Vassar Farm and asks, “When is the Waddle Waddle?” whenever we drive by. Whatever you call the event–the Wally Waddle, the Waddle Waddle, the Big Turtle Race, or the Pie Race–we hope you join us on Mother’s Day for lots of free family fun. 5 years ago when we started the Wa Wa Wally Waddle 5k we wanted to do something different to set us apart from the many other races available to Hudson Valley runners. Being a bit of a running purist (snob), I didn’t want to make the actual race itself anything other than a straight forward 5k in a beautiful setting, so that led us to coming up with a great prize. Sure some people like medals, and some like trophies, while still other prefer gift certificates, but many runners have closets and shelves full of those things (well probably not gift certificates hopefully they spend those). So what is the one thing that ever runner wants? The answer; PIE! Seriously, have you ever met a someone who doesn’t like pie? If you have, I can guarantee that person wasn’t a runner. Heck Runner’s World editor Mark Remy even has a section of the site dedicated to pie and pie related stories. The first year of the Wally Waddle we came up with convoluted way to award the pies. We had 10 Camp Segowea alumni run as a relay team during the 5k, and any runners who beat the relay team won a pie. This lead to a great deal of confusion among the runners, so in our second year we decided to give a pie to the over all winners and the age group winners. This turned out to be much less confusing, and also allowed the camp alumni to actually run the whole 5k if they wanted to. So right about now you might be thinking, “I’m a runner, I like pie, but I don’t think I can win my age group. Maybe the Wally Waddle isn’t for me.” Well don’t fret yet! You see, all our pies are baked fresh by our wonderful team of Camp Segowea alumni, and they are such a dedicated bunch that they always bake way more pies than we need for the age group awards. Now a greedy man might keep all those extra pies to himself, but I’m not such a man. I like to give back to the people. After all the age group pies have been awarded, we raffle off the extra pies based on bib numbers. All you need to do is finish the 5k and your automatically entered into the fresh baked pie raffle! So runners young or old, fast or slow, man or woman, all have a chance to go home with a PIE! But we don’t stop with pie, oh no. We have more wonderful prizes. To see the full list of Wally Waddle awards see our Prizes Page. Register online now!